LAHORE: (Wednesday, December 13, 2017): Punjab University and Securities Exchange Commission of Pakistan have signed a memorandum of understanding for conducting investor education seminars for the enrolled students and to build the capacity of PU teachers through train the trainer program. 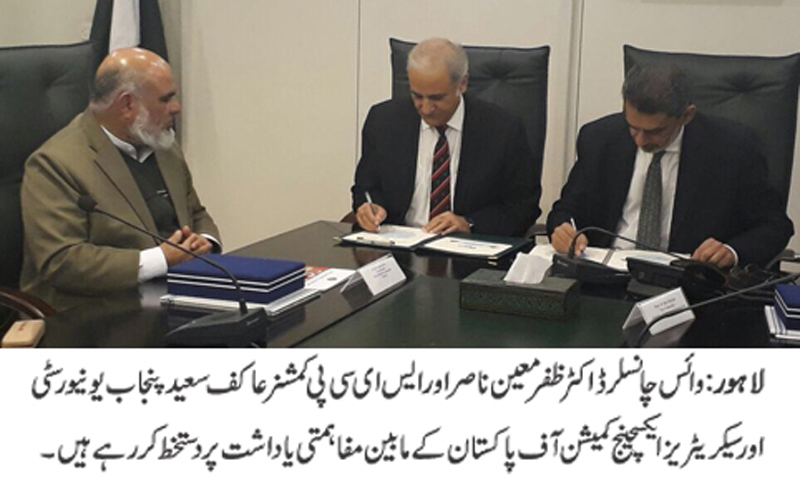 In this regard, the MoU was signed by PU Vice Chancellor Prof Dr Zafar Moeen Nasir and SECP Commissioner (IE& IRD) Mr Akif Saeed. According to the MoU, SECP would ensure availability of resource persons to conduct seminars while PU would provide at least two slots for conducting seminars in each semester. PU would also extend sharing of resources such as its premises and allied facilities including electronic media channel.